First Aid Program is the flagship program of the RCRC Movement and First Aid Training is the strength of the Pakistan Red Crescent (PRC). The PRC has changed its strategic direction to increase its outreach. Initially, the program was running at the NHQ and seven provincial branches, providing regular first aid training through its volunteers all over Pakistan. Keeping in view the increased number of road traffic accidents, bomb blasts, floods and earthquakes, the PRC decided to take up the momentous goal of training a “First Aider in Every Home”. The program will now be implemented in 152 districts of Pakistan, through the District First Aid Trainer in each district. The target audience for the program will be schools, colleges and universities. Pakistan produces about 445,000 university graduates and 10,000 computer science graduates annually. A number of institutions of higher learning are active in the country. Keeping in view Pakistan’s context, these are influential driving forces behind every concept. The PRC First Aid Program targets these institutions to run its First Aid Trainings for their communities who in turn will make it a part of their curriculum and impart first aid skills to each student. To hire 90 District First Aid Trainers plus a pool of First Aid (FA) trained volunteers who conduct five basic First Aid Trainings each month for identified colleges, schools and universities. The District FA Trainer (DFAT) will be responsible not only for training, but also for daily reporting, maintaining data base at the district level and onward submission to Provincial FA Coordinators, who in turn will report to the NHQ. This will be achieved by giving all the DFATs a dashboard reporting application on android phones. The DFATs will feed their reports and participants attendance sheets to their phones, which will be visible to the FA Coordinators at the PHQs and the FA Team at the NHQ. Result I: The target number of schools, colleges and universities have increased knowledge and awareness about First Aid. Result II: The university students’ knowledge and skills about First Aid have increased and now they can skilfully handle emergency situations independently. 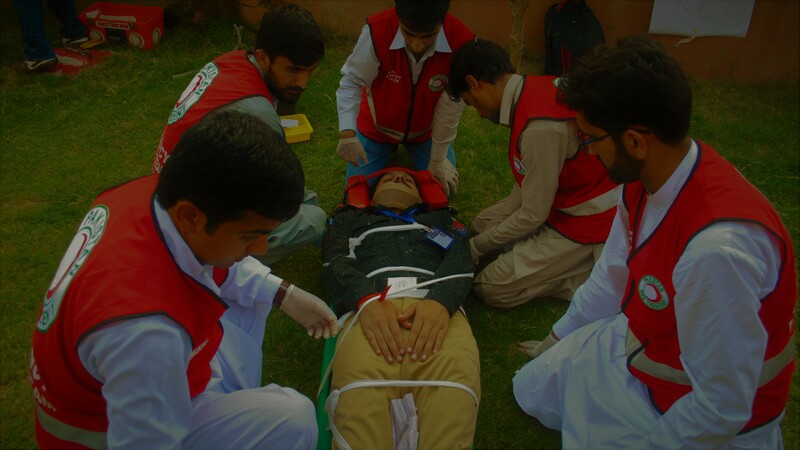 First Aid Program is the flagship program of RCRC Movement and First Aid Trainings are the strength of Pakistan Red Crescent (PRC). PRC has changed its strategic direction to increase its outreach. 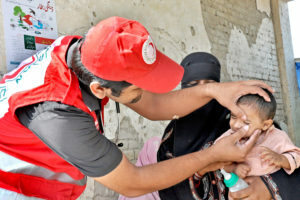 Initially the Program was running in NHQ and 7 x Provincial Branches, providing regular First Aid trainings through it’s volunteers all over Pakistan. Keeping in view the increased number of RTAs, bomb blasts, floods and earthquakes, PRC decided to take up the momentous goal of training a “First Aider in Every Home”. The program will now be implemented in 152 districts of Pakistan, through District First Aid Trainer in each district. The target audience for this program will be educational institution (schools, colleges and universities). Pakistan produces about 445,000 university graduates and 10,000 computer science graduates annually. A number of institutions of higher learning are active in the country, and keeping in view the Pakistan’s Context, these are the influential driving forces behind every concept. PRC First Aid Program target these to run its First Aid Trainings for their communities who in turn will make this a part of their curriculum and train every student the F.A skills. Universities not only spread knowledge, they also spread in the society, to the families and extended families.